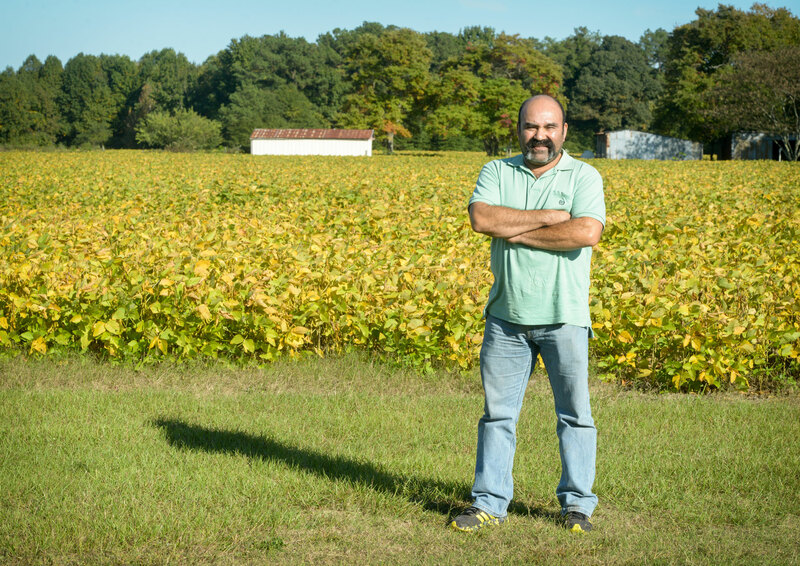 Galván in front of a field in North Carolina. Photos by Kate Medley. Leonardo Galván sped in a black minivan along the straight, flat roads of Sampson County, North Carolina, past wide-open fields of cotton, corn, and tobacco. A cassette scrawled with the words “Canciones Diferentes” rested in the tape player, and a wooden rosary swung from the rearview mirror. Small-framed but muscular, the 54-year-old has a bald head, dark eyebrows, and a thick horseshoe mustache that plunges from the edges of his mouth. He wore black cargo pants and a faded red T-shirt with two pens in its breast pocket. As he drove by four farmworkers lounging on and around a picnic table in front of their living quarters, he honked and waved. The men looked up and waved back. Most of the seasonal workers tending the hot, flat fields of eastern North Carolina know Galván because he has worked for an advocacy organization called the North Carolina Farmworkers Project for the last 13 years. Situated in the 3,000-person town of Benson, the nonprofit provides health and social services to farmworkers in the three counties—Johnston, Sampson and Harnett—with the highest concentration of migrant farmworkers in the state. In the United States, foreign-born workers make up a vast majority—72 percent—of the agricultural labor force. Each growing season, between two and three million migrant and seasonal farmworkers come, mostly from Mexico, to till and plant and tend the country’s crops, working mostly in California, Texas, Washington, Florida, Oregon and North Carolina. Most are male, according to the National Agricultural Workers Survey conducted by the U.S. Department of Labor, and with an average age of 36, most are young—and leave wives and children behind in their home countries. North Carolina boasts an approximately $78 billion agricultural industry, leads the country in its production of tobacco and sweet potatoes, and ranks among the top four states in its production of Christmas trees, cucumbers, strawberries, tomatoes, and cotton. Each growing season, farmers in the state bring in about 100,000 guest workers to help plant and manage the crops. A row of tobacco plants. Despite their numbers in North Carolina and across the United States, migrant laborers are a nearly invisible population, who are overlooked by the general public and lawmakers alike. Though they are working hot, dirty, dangerous, and low-paying jobs that most Americans would rather not. As they put food on our tables, migrant farmworkers receive few labor protections, have little to no political power, and often find themselves exploited by employers looking to keep costs low. In eastern North Carolina, this is where Galván comes in. That evening in early September, Galván was on his way to three of the nearly 150 farmworker camps in the Benson area to transport ailing workers to the Benson Area Medical Center. The clinic stays open late on Thursdays to serve farmworkers free of charge. The workers know that Galván understands the challenges they face. Because he worked a decade in farming himself, they know if they need anything at all—help securing their state identification cards, a lift to the health clinic, assistance in getting money owed them by employers—Galván will drop what he’s doing to help. Several miles down the road, Galván eased the van into the dusty driveway of a farmworker camp surrounded by tobacco fields. He rolled past a tractor pulling a train of carts containing half a dozen men and the tobacco they’d just picked, then past a row of small barns in which harvested leaves hung by their stems. He stopped the car in front of a house at the far end of the property, and a man emerged from the front door. “Vamos, Miguel” Galván shouted out the open car window. Miguel Hernandez took a seat in the back of the van. He looked around 50, with dark, pocked skin and a slight mustache. During the off season, Hernandez returns to Mexico to a taco shop he owns and to help his wife care for their six children, aged six to 26. He came to the United States for the first time several years ago to pay the medical bills of his youngest child, who was born with brain issues and has to see a doctor every three months. Sitting in the backseat of Galván’s van, though, Hernandez was not doing well himself: He was nauseous and could not feel his fingertips—a condition that often results from exposure to pesticides. As Galván navigated the rural roads and picked up two other men, Hernandez admitted that life in the U.S. was much harder than he expected. True, he earns many times what he could make farming in Mexico. But, he said, his employer is hard on the work crew. He rounds their hours worked to his advantage, does not allow them to drink water in the fields except during quick designated breaks, confiscates cell phones during the day, and does not provide washing machines for them to clean their clothes. Close-up of a tobacco leaf. Galván pulled the minivan into the parking lot of the modern brick and stucco health clinic and followed the men into the pastel lobby to wait with them. The next day, he would fill their prescriptions and deliver the medicine to the camps. Galván was born and raised in Coahuila, Mexico, a state in the north-central part of the country along the Texas border. His parents farmed 10 acres of cotton, corn, beans, watermelons and cucumbers until hard times hit in the late 1980s and they had to sell their land. To help provide for his struggling family, Galván attained an H-2A temporary agricultural visa in 1992 and ventured to the United States to work. Unable to speak English at first, Galván taught himself the language by watching YouTube videos and breaking news on MSNBC. As a seasonal farmworker, he spent most of the next decade in North Carolina, usually moving between three or four farms each year. He worked primarily with tobacco but also with sweet potatoes, cucumbers, watermelons, bell peppers, and jalapeños. He capped off most seasons with a Christmas tree harvest before heading back to Mexico for the winter. Naturally outgoing and open-minded, Galván enjoyed the work and got along with most everyone, his Latino coworkers and the American farmers alike. Despite the pleasant parts of the work, Galván faced many hardships. He once caught nine mice in one night in a bunkhouse, and he often lay awake sweating into the early-morning hours because, despite the 100-plus degree temperatures outside, the houses lacked air conditioning. At one camp, he shared a single toilet with 14 others, and at another, he walked into the bathroom for the first time to find nine toilets lined up side by side without dividers. “Come in, amigo, come in,” a man on one of the toilets said to him. But he couldn’t bring himself to join and opted for the woods instead. “Everybody needs privacy!” he said. “There’s discrimination everywhere, and there’s racism everywhere,” Galván said. “When you’re here, you’re like a ghost. People forget you’re here.” Or they don’t realize it in the first place. Despite the unfair, sometimes inhumane conditions, and occasional racist behavior, Galván remembers a few employers fondly, like a tobacco farmer near Winston-Salem who treated his workers with particular kindness. Though the farmer worked his crew from 6 am to 11 pm—“too much,” Galván said—he gave them breaks, sometimes offering them sodas in the shade. On Saturdays, the farmer’s wife would bring chicken or burgers to the camps where the workers lived. And when Galván asked for a place for the workers to keep their dirty clothes to minimize the spread of red dust, the farmer built a porch onto the house and supplied them with dressers. When Galván started attending Saint Bernadette Catholic Church in Fuquay-Varina in 1994, he met an American woman named Cheryl, who taught English classes and picked up and drove farmworkers to mass each Sunday. After several years, Galván and Cheryl married, and Galván stopped working in agriculture. He worked briefly in construction before a friend found him a job as an outreach expert and community educator with the North Carolina Farmworkers Project. Since joining the nonprofit’s staff, Galván has found himself on the other side of the issues he once faced, in a position to try to offer help. In his role, he educates the workers about the dangers of pesticides and the sun, talks to them about health insurance through the Affordable Care Act and helps them sign up, and transports them to the health clinic and wherever else they need to go. He helps farm worker organizations advocate for better living and working conditions and sometimes collects worker signatures for cases the North Carolina Justice Center is pursuing. As part of his job, he also gathers data on farmworker health for research projects conducted by the Wake Forest University Center for Worker Health. Some aspects of farmworker life have improved since Galván’s days in the fields. Employers now fly workers to and from their home countries rather than driving them, air-conditioning units in the bunkhouses are increasingly common, and most workers have cell phones and can more easily communicate with their loved ones. Deep-rooted problems persist. Farm work is one of the lowest paid jobs in the country: On average, a farmworker’s income is $17,000 per year, without benefits, according to the most recent National Agricultural Workers Survey. Some farmers pay their workers by the bag or bucket, which discourages them from taking breaks and, in some cases, works out to less than minimum wage. Additionally, farmworkers often live in substandard housing: More than a quarter of North Carolina farmworker camps violate regulations for bedroom space and laundry facilities, and one in five camps display signs of a rodent infestation, according to a study published in the American Journal of Industrial Medicine in 2011, which Galván helped collect data for in 2007 and 2008. Farmworkers also face numerous health hazards. Many experience heat stress from working steadily through scorching July and August temperatures. Acute nicotine poisoning, called “green tobacco sickness,” afflicts a significant number of farmworkers with headaches, dizziness, insomnia, nausea, vomiting and severe dehydration. (In a single day, a farmworker handling tobacco can absorb the nicotine equivalent of 36 cigarettes through his or her skin.) And most North Carolina farmworkers are exposed to an array of pesticides, sometimes repeatedly, over an agricultural season, putting them at risk of neurological disorders, infertility, memory loss, and depression. Workers commonly experience skin conditions like dermatitis and rashes as well. Alfredo Rodriguez prepares dinner for Galván. While around half of the farmworkers in America are undocumented—and a portion are U.S. citizens or lawful permanent residents—more than 65,000 come to the U.S. each year through the federal certification program. North Carolina is one of the top users of the H-2A program, along with Florida, Georgia, Louisiana and Kentucky. Additionally, the political climate in many places, especially North Carolina, does not welcome the foreign help. North Carolina House Bill 318, the “Protect North Carolina Workers Act,” which passed in October 2015, requires that government employers check workers’ immigration statuses and prohibits undocumented immigrants from using consulate, county or other non-state-government documents as identification. It also prohibits cities from deemphasizing immigration enforcement. Because the law is new and relatively vague about who is affected and who, exactly, is considered a “government official,” North Carolina Farmworkers Project does not yet know how the bill will affect area workers, Jensen said. If county health departments stop accepting people without state IDs or pharmacies stop filling their prescriptions, that would be really problematic, she said. Regardless of the details, Jensen continued, “it’s clearly an anti-immigrant law, and that adds to the sense of fear that a lot of people feel in interacting with law enforcement.” When they’re scared to seek help when they need it, workers are in an even more vulnerable position when, to take a common occurrence in Eastern North Carolina last season, someone breaks into camp and steals their wages while they’re out working. Frustrated by North Carolina lawmakers’ lack of concern for guest workers over the last few years, the Farmworker Advocacy Network, a statewide network of farmworker advocacy organizations, has given up pushing pro-worker legislation, Jensen said. Instead, they are working to promote the enforcement of regulations governing farmworker living and working conditions—like EPA worker protection standards and the state’s Migrant Housing Act requirements. Communication between farm worker advocates and state enforcement agencies has improved. However, the agencies’ lack of resources and personnel prevents them from being able to enforce the laws fully. Also, because enforcement is based on complaints rather than inspections, and workers rarely speak up for fear of retaliation, rule violations often go unchallenged. On a Sunday evening in early October, Galván creaked open the screen door of a low cinderblock bunkhouse at a farm in Fuquay-Varina. Inside, four farmworkers ate dinner around a large table covered with provisions like bananas, Nescafe, Saltine crackers, tortillas and ketchup. The men greeted Galván warmly and offered him a 7 Up and tortilla to fill with one of the chicken concoctions—caldo de pollo or pollo con salsa—that filled the cast-iron skillets amidst the packages on the table. Galván accepted and took a seat between Alfredo Rodriguez, a jolly, shirtless man eating chicken soup and raw jalapeños, and a father and son named Gonzalo and Ernesto Robledo. The setting sun streamed through the open screen door, casting the table in a golden glow, and the radio played in the background. The men discussed events on the farm and the upcoming sweet potato harvest. On Sunday evenings, Galván transports workers to and from their camps to the Spanish-language mass at his church, where he plays guitar and directs the choir. He has just dropped off three passengers at this camp—and stopped inside to say hello to others. Because farmworkers believe in Galván, they listen to him. When he informs them of ways to protect themselves from sunstroke or recommends they sign up for health insurance, they take heed. “The workers trust him, and they trust the information that he gives them,” Wiggins said. Galván hopes he will always be in a position to help farmworkers. But because the funding of North Carolina Farmworkers Project fluctuates and is often precarious, Galván sometimes finds his position in danger. Regardless of his capacity, though, he plans always to stay involved with the farmworker community for years to come. Disclaimer: Some farmerworker names have been changed.